You may remember my post about the Sir Like-A-Lot, which was a kiosk to show how many “Likes” your Facebook page has. I built it for an event that z2 Marketing had last fall. 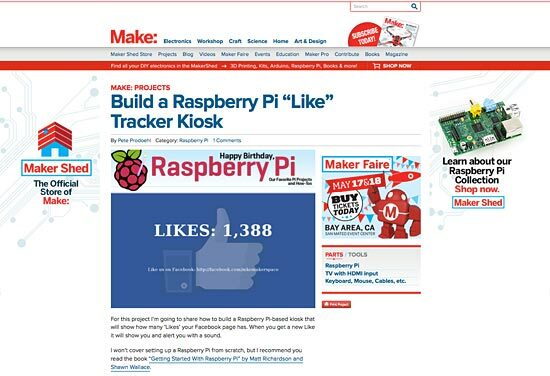 Well, with it being Raspberry Pi week over at Make Magazine, I was asked to write up a proper how-to, so there’s now a nice step-by-step description in the Project section titled Build a Raspberry Pi “Like” Tracker Kiosk. It was a good challenge, as I ended up starting from scratch multiple times, as I wanted to make sure I didn’t miss any steps. Typically, when I build something like this, it’s a bit unstructured, where you install things, configure things, and finally get it working, and then realize your notes are sorely lacking. I also wanted to make things as simple as possibly, and with Perl, that’s not always easy! Anyway, I hope you enjoy the Project, and hopefully I can contribute more in the future. Posted on Thursday, February 27th, 2014 at 8:43 am. Subscribe to the comments feed. Both comments and pings are currently closed. Post on your own blog.